Student researchers from the ElectroScience Laboratory (ESL) at The Ohio State University shared their work on cutting-edge electromagnetics and radio frequency research with representatives from some of the top industries in the country at the 9th-annual CERF Technical Meeting and Affiliates Dinner. CERF, or the Consortium on Electromagnetics and Radio Frequencies, is an alliance allowing ESL faculty, researchers and students to share their expertise with top U.S.-based industries. The event gives industry access to the potential workforce talent at ESL, one of the top research centers worldwide in the realms of electromagnetics and radio frequency research. 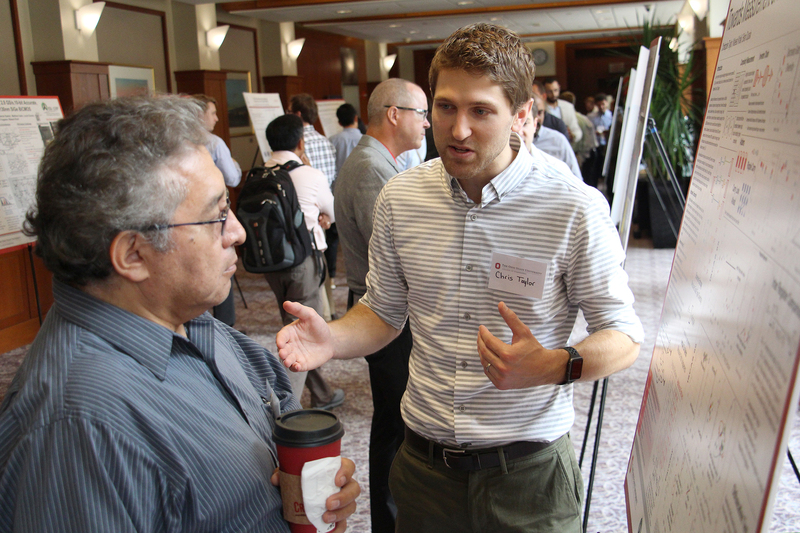 This year, ESL welcomed representatives from BAE Systems, the BerrieHill Research Division of Applied Research Associates, Bridgestone Americas, Lockheed Martin, MIT Lincoln Laboratory, Northrop Grumman and Raytheon to the Blackwell Inn and Pfahl Conference Center at Ohio State on August 7. Communications specialist Ryan Horns was recognized by the College of Engineering for his effort to help shine a spotlight on students and faculty research achievements, while spreading engineering education and knowledge to the public at large. The Engineering Staff Advisory Committee awarded Horns the Outstanding Service “Above and Beyond Award” during its annual Staff Appreciation Luncheon on April 26. Horns is in charge of the flow of research news, award coverage, and faculty and student spotlights within the Department of Electrical and Computer Engineering (ECE). He helps his department and the college explain innovative work to the greater Ohio State community, and beyond, with each story, photo, video and visual design he produces. Additionally, Horns holds a dual role as the communications specialist for the Institute for Materials Research at The Ohio State University. Ohio State Day of Giving is here! Stay connected with the IMR listserv. The Institute for Materials Research (IMR) was established in early 2006 as a multi-college center supported by the University’s College of Engineering, the College of Mathematical and Physical Sciences, the Office for Research and the Office of the Provost to coordinate existing and planned materials research activities, facilities and investments across The Ohio State University. The IMR seeks to create and sustain a community of multidisciplinary materials researchers, capabilities, focus groups and centers that eliminates traditional discipline-driven boundaries at the research level, blends strengths and coordinates facilities so that interdisciplinary materials research leveraging the diverse strengths across the University can thrive. If you have trouble accessing this page and need to request an alternate format, contact OR webmaster.